This collection of papers is dedicated to the memory of Gaetano Fichera, a great mathematician and also a good friend to the editors. Regrettably it took an unusual amount of time to bring this collection out. This was primarily due to the fact that the main editor who had collected all of the materials, for this volume, P. D. Panagiotopoulos, died unexpectedly during the period when we were editing the manuscript. The other two editors in appreciation of Panagiotopoulos' contribution to this field, believe it is therefore fitting that this collection be dedicated to his memory also. The theme of the collection is centered around the seminal research of G. Fichera on the Signorini problem. Variants on this idea enter in different ways. For example, by bringing in friction the problem is no longer self-adjoint and the minimization formulation is not valid. 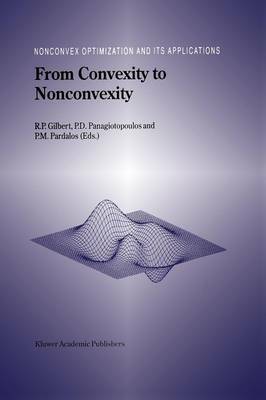 A large portion of this collection is devoted to survey papers concerning hemivariational methods, with a main point of its application to nonsmooth mechanics. Hemivariational inequali- ties, which are a generalization of variational inequalities, were pioneered by Panagiotopoulos. There are many applications of this theory to the study of non convex energy functionals occurring in many branches of mechanics. An area of concentration concerns contact problems, in particular, quasistatic and dynamic contact problems with friction and damage. Nonsmooth optimization methods which may be divided into the main groups of subgradient methods and bundle methods are also discussed in this collection.